An additional source of biologically active substances of plant origin. 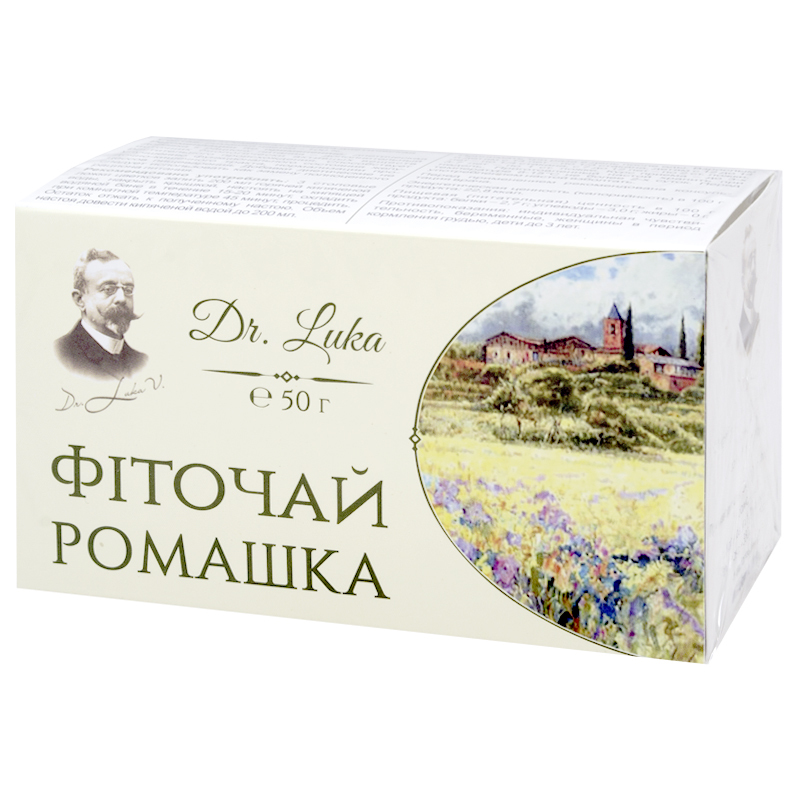 It contributes to improvement of the functional state of the gastrointestinal tract, normalizing digestive processes. Chamomile has anti-inflammatory, diaphoretic, calming, hemostatic and analgesic effect. It relieves spasm, accelerates epithelium regeneration, stops decay and fermentation processes in the intestine, stimulates digestion, has disinfecting properties. In case of gastritis, colitis and inflammatory diseases of the gastrointestinal tract, liver, kidneys, gallbladder, bile and urinary tract diseases chamomile flowers act as soft anti-inflammatory, softening and enveloping remedy. They reduce pain and relieve spasm. In case of flatulence, colitis, proctitis and haemorrhoids enemas with chamomile infusion are administered. Anti-inflammatory properties of chamomile shall be of use in case of conjunctivitis, hordeolum and reddening. For this reason, eyes are washed with chamomile infusion. In case of inflammation of joints and exacerbation of gout, baths are taken and compresses to the damaged areas are applied. Antiviral properties of chamomile help in case of inflammatory diseases: it accelerates recovery, reduces symptoms and relieves mucosa inflammation. Chamomile is applied for mouth rinsing in case of angina, laryngitis, tonsillitis, as well as in case of inflammations in the mouth cavity. In case of chronic bronchopulmonary diseases and bronchial asthma inhalations with chamomile infusion are of use. In case of gynaecological diseases, cystitis, urethritis, prostatitis chamomile flowers are used for washing and vaginal douche. Chamomile infusion or tea serves as calming product in case of hysteria, neuralgia. Chamomile flowers are used for bathing newborns, so that the child could sleep better. Such baths are of use in case of diathesis in children. Douse 3 tablespoons of chamomile flowers with 200 ml of hot boiled water, cover with a lid, let it infuse on a boiling water bath for 15-20 min, cool down at a room temperature for 45 min, strain. Squeeze the rest into the resulting infusion. Reduce the volume of the infusion with boiled water to 200 ml. Take thrice a day after meals. Adults and children since 14 take ⅓ of a glass, children from 12 to 14—¼ of a glass, from 7 to 12 —2 tablespoons, from 3 to 7—1 tablespoon. Term of use — up to 3 weeks. Store prepared infusion at the temperature 8 — 15 °С maximum for two days. Stir before drinking. Individual sensitivity to certain components, pregnancy, lactation, children under 3. Proteins — 2.7 g, carbohydrates — 3.0 g, fats — 0.00 g.